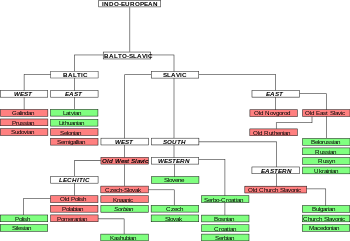 The Slavic languages (also called Slavonic languages) are the Indo-European languages native to the Slavic peoples, originally from Eastern Europe. 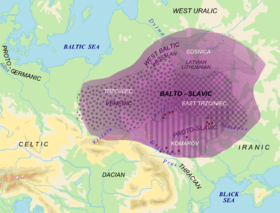 They are thought to descend from a proto-language called Proto-Slavic spoken during the Early Middle Ages, which in turn is thought to have descended from the earlier Proto-Balto-Slavic language, linking the Slavic languages to the Baltic languages in a Balto-Slavic group within the Indo-European family. The Slavic languages are divided intro three subgroups: East, West, and South, which together constitute more than twenty languages. Of these, ten have at least one million speakers and official status as the national languages of the countries in which they are predominantly spoken: Russian, Belarusian and Ukrainian (of the East group), Polish, Czech and Slovak (of the West group) and Slovene, Serbo-Croatian, Macedonian and Bulgarian (of the South group). The current geographic distribution of natively spoken Slavic languages covers Eastern Europe, the Balkans, the eastern parts of Central Europe and all of the territory of Russia, which includes northern and north-central Asia. Furthermore, the diasporas of many Slavic peoples have established isolated minorities of speakers of their languages all over the world. The number of speakers of all Slavic languages together is estimated to be 315 million. Some linguists speculate that a North Slavic branch has existed as well. The Old Novgorod dialect may have reflected some idiosyncrasies of this group. On the other hand, the term "North Slavic" is also used sometimes to combine the West and East Slavic languages into one group, in opposition to the South Slavic languages, due to traits the West and East Slavic branches share with each other that they do not with the South Slavic languages. Mutual intelligibility also plays a role in determining the West, East, and South branches. Speakers of languages within the same branch will in most cases be able to understand each other at least partially, but they are generally unable to across branches (for which it would be comparable to a native English speaker trying to understand any other Germanic language). The most obvious differences between the West and East Slavic branches are in the orthography of the standard languages: West Slavic languages are written in the Latin script, and have had more western European influence due to their speakers being historically Roman Catholic, whereas the East Slavic languages are written in Cyrillic and, with Eastern Orthodox or Uniate faithful, have had more Greek influence. East Slavic languages such as Russian have, however, during and after Peter the Great's Europeanization campaign, absorbed many words of Latin, French, German, and Italian origin, somewhat reducing this difference in influence. Although the South Slavic group has traits that distinguish it from the West or East Slavic branches, within itself it displays much the same variations: Bulgarian, for example, has some East Slavic traits (Cyrillic alphabet, Russian loanwords, and Greek influence) and Croatian many West Slavic ones (Latin alphabet, overall central European influence like Czech), despite both being South Slavic. 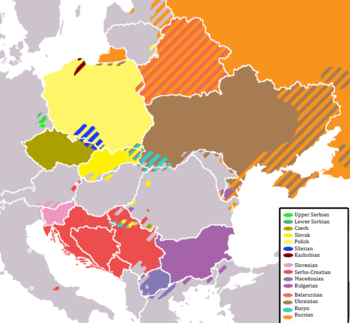 The tripartite division of the Slavic languages does not take into account the spoken dialects of each language. Of these, certain so-called transitional dialects and hybrid dialects often bridge the gaps between different languages, showing similarities that do not stand out when comparing Slavic literary (i.e. standard) languages. For example, Slovak (West Slavic) and Ukrainian (East Slavic) are bridged by the Rusyn of Eastern Slovakia and western Ukraine. Similarly, Polish shares transitional features with both western Ukrainian and Belarusian dialects. The Croatian Kajkavian dialect is more similar to Slovene than to the standard Croatian language. The sound [ɨ] occurs only in some languages (Russian, Belarusian, Polish), and even in these languages, it is unclear whether it is its own phoneme or an allophone of /i/. Nonetheless, it is a quite prominent and noticeable characteristic of the languages in which it is present. Russian мышь [mɨʂ] and Polish mysz [mɨʂ] "mouse"
Other phonemic vowels are found in certain languages (e.g. the schwa /ǝ/ in Bulgarian and Slovenian, distinct high-mid and low-mid vowels in Slovenian, and the lax front vowel /ɪ/ in Ukrainian). Most languages of the former Soviet Union and of some neighbouring countries (for example, Mongolian) are significantly influenced by Russian, especially in vocabulary. In the south, the Romanian, Albanian, and Hungarian languages show the influence of the neighboring Slavic nations, especially in vocabulary pertaining to urban life, agriculture, and crafts and trade—the major cultural innovations at times of limited long-range cultural contact. In each one of these languages, Slavic lexical borrowings represent at least 20% of the total vocabulary. However, Romanian has much lower influence from Slavic than Albanian or Hungarian . This is because Slavic tribes crossed and partially settled the territories inhabited by ancient Illyrians and Vlachs on their way to the Balkans. Church Slavonic language, derived from Old Church Slavonic, but with significant replacement of the original vocabulary by forms from the Old Russian language and other regional forms. The Bulgarian Orthodox Church, Russian Orthodox Church, Polish Orthodox Church, Macedonian Orthodox Church, Serbian Orthodox Church, and even some Roman Catholic Churches in Croatia continue to use Church Slavonic as a liturgical language. While not used in modern times, the text of a Church Slavonic Roman Rite Mass survives in Croatia and the Czech Republic, which is best known through Janáček's musical setting of it (the Glagolitic Mass). ↑ Hammarström, Harald; Forkel, Robert; Haspelmath, Martin; Bank, Sebastian, eds. (2016). "Slavic". Glottolog 2.7. Jena: Max Planck Institute for the Science of Human History. ↑ According to the data taken from Anatole V. Lyovin, An Introduction to the Languages of the World, Oxford University Press, New York – Oxford, 1997. ↑ cf. Novotná & Blažek (2007) with references. "Classical glottochronology" conducted by Czech Slavist M. Čejka in 1974 dates the Balto-Slavic split to −910±340 BCE, Sergei Starostin in 1994 dates it to 1210 BCE, and "recalibrated glottochronology" conducted by Novotná & Blažek dates it to 1400–1340 BCE. This agrees well with Trziniec-Komarov culture, localized from Silesia to Central Ukraine and dated to the period 1500–1200 BCE. ↑ Kapović (2008, p. 94) "Kako rekosmo, nije sigurno je li uopće bilo prabaltijskoga jezika. Čini se da su dvije posvjedočene, preživjele grane baltijskoga, istočna i zapadna, različite jedna od druge izvorno kao i svaka posebno od praslavenskoga". ↑ Hellquist, Elof (1922). "torg". Svensk etymologisk ordbok (in Swedish). Project Runeberg. Retrieved 2006-12-27. ↑ Hellquist, Elof (1922). "tolk". Svensk etymologisk ordbok (in Swedish). Project Runeberg. Retrieved 2006-12-27. ↑ Hellquist, Elof (1922). "pråm". Svensk etymologisk ordbok (in Swedish). Project Runeberg. Retrieved 2006-12-27. ↑ Harper, Douglas. "vodka". Online Etymology Dictionary. Retrieved 2007-05-18. ↑ Harper, Douglas. "sable". Online Etymology Dictionary. Retrieved 2007-05-18. ↑ cf. : Deutsches Wörterbuch von Jacob Grimm und Wilhelm Grimm. 16 Bde. [in 32 Teilbänden. Leipzig: S. Hirzel 1854–1960. ], s.v. Vampir; Trésor de la Langue Française informatisé; Dauzat, Albert, 1938. Dictionnaire étymologique. Librairie Larousse; Wolfgang Pfeifer, Етymologisches Woerterbuch, 2006, p. 1494; Petar Skok, Etimologijski rjecnk hrvatskoga ili srpskoga jezika, 1971–1974, s.v. Vampir; Tokarev, S.A. et al. 1982. Mify narodov mira. ("Myths of the peoples of the world". A Russian encyclopedia of mythology); Russian Etymological Dictionary by Max Vasmer. ↑ Harper, Douglas. "vampire". Online Etymology Dictionary. Retrieved 2007-09-21. ↑ "Indo-European, Slavic". Language Family Trees. Ethnologue. 2006. Retrieved 2006-12-27. Novotná, Petra; Blažek, Václav (2007). "Glottochronolgy and its application to the Balto-Slavic languages" (PDF). Baltistica. XLII (2): 185–210. Leo Wiener (1920). "Slavic Languages". Encyclopedia Americana.